The Southern Upland Way is Scotland’s longest footpath and Britain’s longest coast to coast path. Passing through some magnificent scenery, this magnificent walk provides – perhaps more than any other long distance path – the opportunity for some solitude while walking. This solitude is no doubt partly a result of its fearsome reputation among walkers, largely because it goes through wild and remote countryside, with accommodation often 20 to 30 miles apart. Indeed, much of the promotional literature for the route emphasises its tough and challenging nature. However, with a little planning and know how, any experienced walker can complete this route. If you enjoy long and challenging treks with a backpack, then this walk is certainly the walk for you. However, it is also an option for those who like a relaxing holiday rather than a serious challenge. Most of the accommodation providers will help out with lifts if necessary, and it is still very satisfying when done this way. There is plenty to enjoy along the way as well. Changes to the route have reduced the amount of road walking, while felling and replanting with deciduous trees mean some of the longer stretches through plantations are now very pleasant woodland walking. And lovers of moorland flowers and birds will particularly enjoy this walk; buzzards and kites are plentiful. The best way to enjoy the walk is to plan ahead, and this route needs more planning than most long-distance paths. You need to spend a decent amount of time before setting off with guidebooks and maps, checking out each section and booking accommodation. The Southern Uplands Way website lists accommodation and indicates which places will provide lifts to reduce the longer sections. Because of its remoteness, the Southern Upland Way is best tackled by those who have completed another long-distance path. It is crucial to be confident and competent with a map and compass, even though much of the path is waymarked and clear on the ground. It is definitely useful to have a GPS in addition to your map and compass. Being comfortable walking on your own is an advantage: you may have several days when you do not see another person. Good all-weather clothing and equipment is a must, as the western section is sometimes exposed to the full fury of north Atlantic weather systems – rain can be very heavy indeed. If you have the flexibility, wait for a good weather forecast before setting off. While much of the route is easy going, some of the ground is rough or boggy. Good quality boots and gaiters will keep your feet dry (Páramo gaiters have a soft lining and can be worn with shorts in warm weather). Trekking poles will help you pick your way across marshy ground as necessary. While much of this walk can be done car-free, there are places where arranging a pick-up from accommodation providers is unavoidable. These lifts add to the cost, maybe £200 to £250 for the whole walk (although these are shared if you walk with a group). The route is usually walked from west to east. The starting point is Portpatrick, and there is a weekday bus from Dumfries to Stranraer which has connections to PortpatrickA Dumfries and Galloway Freedom ticket is a good option. The nearest railway station to the start is Stranraer. If you want to break the walk up into separate sections into 3-4 day sections, with more travel time and overnight stays, there are buses to Glentrool and Dalry. Stations along the route include Sanquhar, Dumfries, Lockerbie (for buses to Beattock and Moffat), Carlisle (for buses to Galashiels and Dumfries). At the end, there are buses from Cockburnspath to Dunbar or Berwick upon Tweed. You can get cheap deals on the train if you book ahead. You can either carry your luggage or pay for someone to take it by vehicle to your next stop-off point. Many days can be done with a day sack; however, it is easy enough to carry all your stuff if you know how to travel light. Here is a possible breakdown of the route, split day by day into manageable sections, and highlighting some good places to stay (full accommodations options can be found on the official website). Some sections could be merged or broken down differently. As a rough guide, it makes sense to do Portpatrick to Dalry in one week, and Dalry to Moffat in another week. Travel/arrival day. Portpatrick, the start of the walk, is a nice place to stay, but if you opt for Stranraer you can reach Portpatrick by bus. 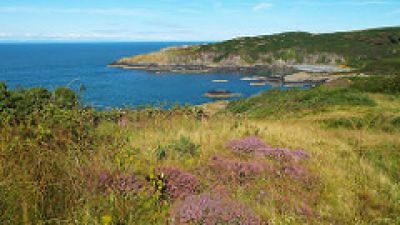 Portpatrick to Castle Kennedy: 14 miles (or 16 miles to Chlenry Farm B&B). There are buses from Castle Kennedy to Stranraer. Castle Kennedy to New Luce B&B: 12 miles. New Luce to Knowe: 14 miles. You may need to arrange a pick-up for some of the accommodation options, for example if you stay at House o’ Hill. Knowe to House o’ Hill, Bargrenna: 5 miles. There are buses from here. House o’ Hill to Caldons/Glen Trool: 8 miles. Caldons to Upper Craigenbay: 13 miles (you will need to arrange a pick-up). 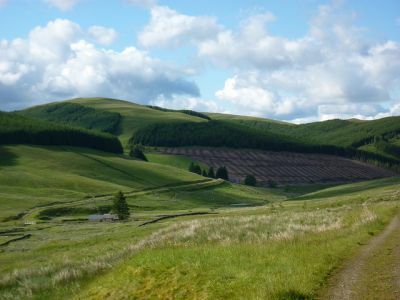 Dalry to Stroanpatrick: 8 miles (some walkers might choose to combine sections 3 and 4). Stroanpatrick to Nether Holm of Dalquhairn (off the main route): 12 miles. Nether Holm of Dalquhairn to Sanquhar 12 miles. There are trains from Sanquhar. For stages 5 and 6, you need to leave the path at Polskeoch and take the Lorg path. Some transport providers can take you to Lorg (off road). Sanquhar Wanlockhead: 8 miles. Accommodation options at both Wanlockhead and Leadhills. If you can get to Sanquhar for 14.30, you will have time to do this as an afternoon walk in the summer. Daer Reservoir to Moffat: 11–14 miles. Accommodation at Beattock and Moffat, and transport links. Note. The section from Traquair to Melrose can be done while based at Melrose using frequent buses to get to and from your walk. Moffat to Scabcleugh: 15 miles. The Moffat Tibbie Shiels section can be split anywhere between Broadgairhill and Scabcleugh. Accommodation options include Hartleap B&B or St Mary’s Loch Cappercleugh B&B. Scabcleugh to Tibbie Shiels: 10 miles, or to Dryhope: 13 miles. Tibbie Shiels/Dryhope to Innerleithen: 10–13 miles. Note that Innerleithen is a good mile off route from Traquair. Innerleithen to Galashiels: 14 miles. A hard day, but using buses avoids carrying any more than a day sack. Galashiels to Melrose: 5 miles. A short day, so climb the three Eildons at the end! There are buses from Melrose, and a railway station at Tweedbank. Travel day. 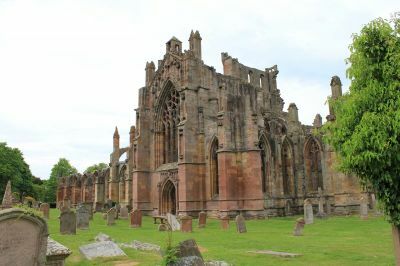 You can climb the Eildons and/or visit the abbey if you arrive early. Melrose to Lauder: 11 miles. You can stay at Lauder or Melrose and use the bus to save bag carrying. Lauder to Longformacus: 16 miles. Longformacus to Abbey St Bathans: 8 miles. Abbey St Bathans to Cockburnspath: 10 miles. There are no accommodation at present, but buses to Dunbar and Berwick. For more information about the route, try the Cicerone guide by Alan Castle, who is also the keeper of the Hillwalkers' Register.